We know you've seen the 2010 Chevy Camaro plenty of times by now, but trust us, you haven't heard it quite like this. It must be the fanboys at Camaro5's response to Lexus trying to steal the spy video thunder with the LF-A video from earlier. Because thunder is exactly what the Camaro's big 'merican V8 sounds like as it races around the famed German track. The video is over six minutes of rumbling goodness, so you might want to let it load a bit before watching. Ooh, and look, a Pontiac G8 GXP was there too. 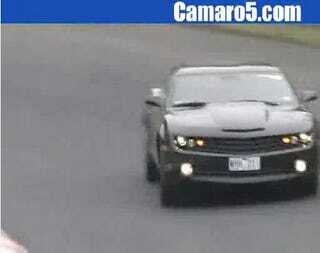 2010 Chevy Camaro SS Caught On Nurburgring, Stig At The Wheel?